Ferreira, L. E. B, Gomes, H. M., Bifet, A. Oliveira, L. S., Cost-sensitive Adaptive Random Forests for Imbalanced data Streams, International Joint Conference on Neural Networks (IJCNN 2019), Budapest, Hungary, 2019. Moura, T. J. M., Cavalcanti, G., Oliveira, L. S., Evaluating Competence Measures for Dynamic Regressor Selection, International Joint Conference on Neural Networks (IJCNN 2019), Budapest, Hungary, 2019. Matos, J., Britto Jr, A. S., Oliveira, L. S., Koerich, A., Double Transfer Learning for Breast Cancer Histopathologic Image Classification, International Joint Conference on Neural Networks (IJCNN 2019), Budapest, Hungary, 2019. Pereira, R., Costa, Y., Aguiar, R., Britto Jr., A. S., Oliveira, L. S., Silla Jr., C. Representation Learning vs. Handcrafted Features for Music Genre Classification, International Joint Conference on Neural Networks (IJCNN 2019), Budapest, Hungary, 2019. Wiggers, K., Britto Jr., A.S., Heutte, L., Koerich, A., Oliveira, L. S., Image Retrieval and Pattern Spotting using Siamese Neural Network, International Joint Conference on Neural Networks (IJCNN 2019), Budapest, Hungary, 2019. Zanlorensi, L., Luz, E., Laroca, R., Britto, A., Oliveira, L. S., Menotti, D. The Impact of Preprocessing on Deep Representations for Iris Recognition on Unconstrained Environments, 31st Conference on Graphics, Patterns, and Images (SIBGRAPI 2018), Foz do Iguaçu, Brazil, 2018. Pereira, M. T,, Britto Jr. A. S., Oliveira, L. S., Sabourin, R., Dynamic Ensemble Selection by K-Nearest Local Oracles with Discrimination Index, IEEE International Conference on Tools with Artificial Intelligence (ICTAI 2018), Volos, Greece, 2018. Martins, J., Oliveira, L. S., Britto Jr. A. S., Sabourin, R., Forest species recognition based on ensemble of classifiers, IEEE International Conference on Tools with Artificial Intelligence (ICTAI 2018), Volos, Greece, 2018. Paulino, M. A., Svaigen, A., Costa, Y., Aylon, L., Britto Jr. A. S., Oliveira, L. S., A Brazilian Speech Database, IEEE International Conference on Tools with Artificial Intelligence (ICTAI 2018), Volos, Greece, 2018. Araújo, V., Britto Jr, A. S., Brun, A. L., Koerich, A., Oliveira, L. S. Fine-grained Hierarchical Classification of Plant Leaf Images using Fusion of Deep Models, IEEE International Conference on Tools with Artificial Intelligence (ICTAI 2018), Volos, Greece, 2018. Viegas, E. Abreu, V., Santin, A., Oliveira, L. S, Enabling Anomaly-based Intrusion Detection Through Model Generalization, IEEE Symposium on Computers and Communications (IEEE ISCC 2018), 2018. Wiggers, K. L., Britto JR., A., S., Heutte, L., Koerich, A., Oliveira, L. S., Document Image Retrieval Using Deep Features, International Joint Conference on Neural Networks (IJCNN 2018), Rio de Janeiro, 2018. Laroca, R., Severo, E., Zanlorensi, L., Oliveira, L. S., Goncalves, G., Schwartz, W., Menotti, D., A Robust Real-Time Automatic License Plate Recognition based on the DCNN YOLO Detector, International Joint Conference on Neural Networks (IJCNN 2018), Rio de Janeiro, 2018. Trois, C., Bona, L. C. E., Oliveira, L. S., Exploring Textures in Traffic Matrices to Classify Data Center Communications.IEEE International Conference on Advanced Information Networking and Applications, Krakow, Poland, 2018. Buiar, J., Pimentel, A., Oliveira, L. S., Um modelo de inferência automatizado baseado no perfil de personalidade identificado nos textos produzidos pelo aluno, Simpósio Brasileiro de Informática na Educação (XXVIII SBIE), Recife, 2017 (in Portuguese). Olivo, C., Santin, A., Oliveira, L.S. Using Huffman Trees in Features Selection to Enhance Performance in Spam Detection, Simpósio Brasileiro de Segurança da Informação e de Sistemas Computacionais (SBSeg), Brasilia, 2017. Cavalin, P., Oliveira, L. S., Kapp, M., Multi-scale Texture Recognition Systems with Reduced Cost: a Case Study on Forest Species, IEEE International Conference on Systems, Man, and Cybernetics (IEEE SMC 2017), Banff, Canada, 2017. Viegas, E., Santin, A., Abreu, V., Oliveira, L. S., Stream Learning and Anomaly-based Intrusion Detection in the Adversarial Settings, IEEE Symposium on Computers and Communications (ISCC), Crete, Greece, 2017. Silva, E., Britto Jr., A. S., Oliveira, L. S., Enembreck, F., Sabourin, R., Koerich, A., A Two-Step Method for Designing Efficient Multiple Classifier Systems, International Joint Conference on Neural Networks (IJCNN 2017), Anchorage, USA, 2017. Hafemann, L.G., Sabourin, R., Oliveira, L. S., Analyzing Features Learned for Offline Signature Verification using Deep CNNs, International Conference on Pattern Recognition (ICPR 2016), pages 2984-2989, Cancun, Mexico, 2016 [pdf]. Bertolini, D., Oliveira, L. S., Sabourin, R., Multi-script Writer Identification using Dissimilarity, International Conference on Pattern Recognition (ICPR 2016), pages 3020-3025, Cancun, Mexico, 2016 [pdf]. Brun, A. L., Britto Jr. A. S., Oliveira, L. S., Enembreck, F., and Sabourin, R., Contribution of Data Complexity Features on Dynamic Classifier Selection, International Joint Conference on Neural Networks (IJCNN 2016), pages 4396-4403, Vancouver, Canada, 2016. Bertolini, D. Oliveira, L. S., Sabourin, R., Improving Writer Identification Through Writer Selection, 20th Iberoamerican Congress on Pattern Recognition (CIARP 2015), Montevideo, Uruguay, 2015. Aires, S., Freitas, C., Oliveira, L. S., SIFT Applied to Perceptual Zoning for Trademark Retrieval, IEEE International Conference on Systems, Man, and Cybernetics (IEEE SMC 2015), Hong Kong, 2015. Stiehl, D., Oliveira, L. S., Guimarães, C., Britto Jr., A. S, Towards a SignWriting Recognition System, International Conference on Document Analysis and Recognition (ICDAR 2015), Mancy, France, 2015 [pdf]. Vriesmann, L.M, Britto Jr, A. S., Oliveira, L. S., Koerich, A. L., Sabourin, R., Combining Overall and Local Class Accuracies in an Oracle-based Method for Dynamic Ensemble Selection, International Joint Conference on Neural Networks (IJCNN 2015), pages 323-329, Killarney, Ireland, 2015. Haffemann, L. G. ; Cavalin, P. ; Oliveira, L.S. . Forest Species Recognition using Deep Convolutional Neural Networks. International Conference on Pattern Recognition (ICPR2014), pages 1103-1107, Stockholm, Sweden, 2014. Bertolini, D., Oliveira, L. S., Justino, E., Sabourin, R., Assessing Textural Features For Writer Identification on Different Writing Styles and Forgeries. International Conference on Pattern Recognition (ICPR2014), pages 268-272, Stockholm, Sweden, 2014. Diem, M., Saavedra, J., Barrios, J. M., Contreras, D., Oliveira, L. S., ICFHR 2014 Competition on Handwritten Digit String Recognition in Challenging Datasets (HDSRC 2014), International Conference on Frontiers of Handwriting Recognition (ICFHR2014), pages 779-784, Crete Island, Greece 2014. Mendonça, V. G., Britto Jr, A., Facon, J., Koerich, A., Oliveira, L. S. , An HMM-based Gesture Recognition Method Trained on Few Samples. IEEE International Conference on Tools with Artificial Intelligence (ICTAI2014), .640-646, Limassol, Cyprus, 2014. Aires, S., Freitas, C., Oliveira, L. S., Feature Analysis for Content-based Trademark Retrieval. 27th International Conference on Computer Applications in Industry and Engineering, New Orleans, USA, 2014. Varela, P. J., Justino, E., Oliveira, L.S., Uso de níveis estruturais e algoritmos genéticos na atribuição de autoria em língua Portuguesa. 9a. Conferencía Ibérica de Sistemas y Tecnologías da Informácion, pages p. 296-298, Barcelona, Spain, 2014. Guimarães, C., Guardezi, J. Oliveira L. S., Deaf Culture and Sign Language Writing System – a Database for a New Approach to Writing System Recognition Technology, Hawaian International Conference on System Sciences (HICSS 14), pages 3368-3375, Hawaii, USA, 2014. Costa Y., Oliveira, L. S., Koerich, A., Gouyon, F., Music Genre Recognition using Gabor Filters and LPQ Texture Descriptors, 18th Iberoamerican Congress on Pattern Recognition (CIARP 2013), pages, 67-74, Havana, Cuba, 2013. Nassu, B. T., Minetto, R., Oliveira, L. S., Text Line Detection in Document Images: Towards a Support System for the Blind, International Conference on Document Analysis and Recognition (ICDAR 2013), pages 638-642, Washington, USA, 2013. Almeida, P., Oliveira, L. S., Silva Jr, E., Britto Jr, A., Koerich, A., Parking Space Detection using Textural Descriptors, 2013 IEEE International Conference on Systems, Man, and Cybernetics (IEEE SMC), pages 3603-3608, Manchester, UK, 2013. Porfirio, A., Weingaertner, D., Oliveira, L. S., LIBRAS Sign Language Hand Configuration Recognition Based on 3D Meshes, 2013 IEEE International Conference on Systems, Man, and Cybernetics (IEEE SMC), pages 1588-1593, Manchester, UK, 2013. Costa Y., Oliveira, L. S., Koerich, A., Gouyon, F., Music Genre Recognition Based on Visual Features with Dynamic Ensemble of Classifiers Selection. 20th International Conference on Systems, Signals and Image Processing (IWSSIP 2013), pages 55-58, Bucharest, 2013. Cavalin, P., Martins, J., Kapp, M., Oliveira, L. S., A Multiple Feature Vector Framework for Forest Species Recognition, 28th ACM Symposium on Applied Computing (ACM SAC 2013), pages 16-20, Coimbra, Portugal, 2013. Almeida, P., Celinski, T. Oliveira, L. S., Britto, A. S. Jr, Koerich, A., Music Genre Classification using Dynamic Selection of Ensemble of Classifiers, 2012 IEEE International Conference on Systems, Man, and Cybernetics (IEEE SMC), pages 2700-2705, Seoul, South Korea, 2012. Oliveira Jr, W., Justino, E., Oliveira, L. S., Identificação de Autoria de Documentos Eletrônicos, XII Simpósio Brasileiro de Segurança da Informação e de Sistemas Computacionais (SBSeg 2012), pages 277-287, Curitiba, Brazil, 2012 (in Portuguese). Oliveira Jr, W., Justino, E., Oliveira, L. S., O uso de Algoritmos de Compressão de Dados na Verificação da Autoria de Textos, IX Encontro Nacional de Inteligência Artificial (ENIA 2012), pages 1-12, Curitiba, Brazil, 2012 (in Portuguese). Oliveira Jr, W., Justino, E., Oliveira, L. S., Authorship Attribution of Electronic Documents Comparing the Use of Normalized Compression Distance and Support Vector Machine in Authorship Attribution, 19th International Conference on Neural Information Processing (ICONIP 2012), pages 632-639, Doha, Qatar, 2012. Martins, J., Oliveira, L. S., Sabourin, R., Combining Textural Descriptors for Forest Species Recognition, 38th Annual Conference of the IEEE Industrial Electronics Society (IECON 2012), pages 1483-1488, Montreal, Canada, 2012. Costa Y., Oliveira, L. S., Koerich, A. L., Gouyon, F., Comparing Textural Features for Music Genre Recognition, IEEE International Joint Conference on Neural Networks (IJCNN 2012), pages 1867-1872, Brisbane, Australia, 2012. Dittrich, F., Koerich, A., Oliveira, L. S., People Counting In Crowded Scenes Using Multiple Cameras, 19th International Conference on Systems, Signals and Image Processing (IWSSIP 2012), pages 138-141, Viena, Austria, 2012. Ribas, F. C., Oliveira, L. S., Britto Jr., A. S., Sabourin, Assessing Handwitten Digit Segmentation Algorithms, 27th ACM Symposium on Applied Computing (ACM SAC 2012), pages 772-776, Riva del Garda, Italy, 2012. Silva, H., Oliveira, L. S., Britto Jr, A., Koerich, A., A Multilevel Algorithm for the Network Design Problem, 37th Annual Conference of the IEEE Industrial Electronics Society (IECON 2011), pages 2225-2229, Melbourne, Australia, 2011. Mansano, M., Pavesi, L., Oliveira, L. S., Britto Jr, A., Koerich, A., Inspection of Metallic Surfaces using Local Binary Patterns, 37th Annual Conference of the IEEE Industrial Electronics Society (IECON 2011), pages 2152-2156, Melbourne, Australia, 2011. Varela, P. J., E. Justino, E., Oliveira, L.S., Identificação de Autoria de Textos através do uso de Classes Linguísticas da Língua Portuguesa, 8th Brazilian Symposium in Information and Human Language Technology, pages 174-178, Cuiaba, Brazil, 2011. Veloso, L., Carvalho, J. M., Freitas, C., Oliveira, L. S., Lexicon-free Writer Dependent Approach for Off-line Handwritten Word Recognition, XXIX Brasileiro de Telecomunicações (SBrT), pages 1-5, Curitiba, Brazil, 2011. Martins J. G., Costa, Y. M. G., Bertolini, D. Oliveira L. S. Uso de descritores de textura extraídos de GLCM para o reconhecimento de padrões em diferentes domínios de aplicação. XXXVII Conferência Latinoamericana de Informática (CLEI 2011), pages 689-705, Quito, Equador, 2011. Varela, P. J., E. Justino, E., Oliveira, L. S., Selecting Syntactic Attributes for Authorship Attribution, IEEE International Joint Conference on Neural Networks (IJCNN 2011), pages 167-172, San Jose, USA, 2011. Costa Y., Oliveira, L. S., Koerich, A. L., Gouyon, F., Music Genre Recognition Using Spectrograms, 18th International Conference on Systems, Signals and Image Processing (IWSSIP 2011), pages 151-154, Sarajevo, Bosnia Herzegovina, 2011. Costa Y., Oliveira, L. S., Koerich, A. L., Gouyon, F., Classificação de Gêneros Musicais por Texturas no Espaço de Frequência, XXXVIII Seminário Integrado de Software e Hardware (SEMISH-CSBC), Natal, Brazil, 2011. Pimenta, A., Justino, E., Oliveira, L. S., Reconstrução Digital de Documentos Mutilados usando Programação Dinâmica e Algoritmo de Prim Modificado, VII Computer Vision Workshop (WVC), pages 243-248, Curitiba, Brazil, 2011. Martins, J., Paula Filho, P. L., Nisgoski, S., Oliveira, L. S., Classificação Automática de Grupos de Espécies Florestais, VII Computer Vision Workshop (WVC), pages 28-33, Curitiba, Brazil, 2011. Antunes, D. R., Guimarães, C., García, L. S., Oliveira, L. S., Fernandes, S., Framework to Support Development of Sign Language Human-Computer Interaction: Building Tools for Effective Information Access and Inclusion of the Deaf, IEEE Fifth International Conference on Research Challenges in Information Science (IEEE RCIS), pages 126-137, Guadeloupe, France, 2011. Zavaschi, T., Oliveira, L. S., Koerich., A. L., Facial Expression Recognition Using Ensemble of Classifiers, IEEE International Conference on Acoustics, Speech, and Signal Processing (ICASSP 2011), pages 1289-1492, Prague, Czech Republic, 2011. Silva, H. A., Oliveira, L. S., Britto Jr. A. S.,. Proposta de Planejamento em Etapas para Redes Secundárias de Telecomunicações. XI Simpósio Brasileiro de GeoInformática (GeoInfo), Campos do Jordão, Brazil, 2010. Koerich, A., Britto Jr., A., Oliveira, L. S., Verification of Unconstrained Handwritten Words at Character Level, 10th International Conference on Frontiers in Handwriting Recognition (ICFHR2010), pages 39-44, Kolkata, India, 2010. Paula Filho, P. L., Oliveira, L. S., Britto Jr, A., Sabourin, R., Forest Species Recognition using Color-based Features, 20th International Conference on Pattern Recognition (ICPR2010), pages 4178-4181, Istambul, Turkey, 2010. Lopes, M., Gouyon, F., Koerich, A., Oliveira, L. S., Selection of Training Instances for Music Genre Classification, 20th International Conference on Pattern Recognition (ICPR2010), pages 4569-4572, Istambul, Turkey, 2010. Varela, P., Justino, E., Oliveira, L. S., Verbs and Pronouns for Authorship Attribution, 17th International Conference on Systems, Signals and Image Processing (IWSSIP 2010), pages 89-92, Rio de Janeiro, Brazil, 2010. Vriesmann, L. M., Britto Jr., A., Oliveira, L. S., Sabourin, R., Ko, A., Using Additional Neighborhood Information in a Dynamic Ensemble Selection Method: Improving the KNORA approach, 17th International Conference on Systems, Signals and Image Processing (IWSSIP 2010), pages 420-423, Rio de Janeiro, Brazil, 2010. Britto Jr. A., Oliveira, L. S., Koerich, A., Face Recognition Using Selected 2DPCA Coefficients, 17th International Conference on Systems, Signals and Image Processing (IWSSIP 2010), pages 490-493, Rio de Janeiro, Brazil, 2010. Rios, I., Britto Jr., A., Koerich, A., Oliveira, L. S., Evaluation of Different Features Sets in an OCR Free Method for Word Spotting in Printed Documents, 25th ACM Symposium On Applied Computing (SAC2010), pages 52-56, Sierre, Switzerland, 2010. Paula Filho P. L., Oliveira, L.S., Britto Jr, A., A Database for Forest Species Recognition, XXII Brazilian Symposium on Computer Graphics and Image Processing (SIBGRAPI 2009), Rio de Janeiro, Brazil, 2009. Varela, P. J., E. Justino, E., Oliveira, L.S., O Uso de Dicionário de Atributos Estilométricos na Identificação de Autoria de Textos de Língua Portuguesa, 7th Brazilian Symposium in Information and Human Language Technology, São Carlos, Brazil, 2009. Paula Filho, P. L., Roiek, D. R., Tusser, A. M., Oliveira, L.S., Análise de Cor para o Reconhecimento de Espécies Florestais. 8th Brazilian Conference on Dynamics, Control and Applications (DINCON 2009), Bauru, 2009. 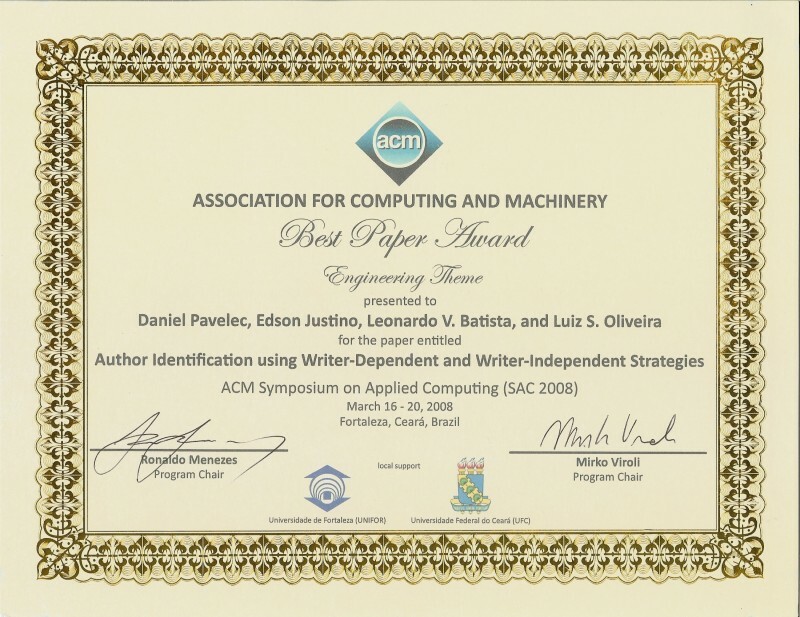 Pavelec, D., Oliveira, L.S., Justino, E., Batista, L. V., Compression and Stylometry for Author Identification, International Joint Conference on Neural Networks (IJCNN 2009), pages 2445-2450, Atlanta, USA, 2009. Pimenta, A., Justino, E., Oliveira, L. S., Sabourin, R., Document Reconstruction using Dynamic Programming, IEEE International Conference on Acoustics, Speech, and Signal Processing (ICASSP 2009), pages 1393-1396, Taipei, Taiwan, April 16-24, 2009. Santos, M., Britto Jr., A, Oliveira, L. S., Koerich, Sabourin, R., Combinando Características Complementares em Modelos Escondidos de Markov: Uma Otimização para o Reconhecimento de Caracteres Manuscritos, XXXIV Latin American Conference on Informatics (CLEI 2008), Santa Fe, Argentina, 2008. Bertolini, D., Oliveira, L. S., Justino, E., Sabourin, R., Ensemble of Classifiers for Off-line Signature Verification. IEEE International Conference on System, Man and Cybernetics (SMC 2008), pages 283-288, Singapore, 2008. Freitas, C., Oliveira, L. S., Sabourin, R., Bortolozzi, F., Brazilian Forensic Letter Database, 11th International Workshop on Frontiers on Handwriting Recognition (IWFHR-11), Montreal, QC, Canada, August 19-21 2008. Santos, E. M., Sabourin, R., Oliveira, L. S., Maupin, P., Overfitting in the Selection of Classifier Ensembles: a Comparative Study Between PSO and GA, 2008 Genetic and Evolutionary Computation Conference (GECCO 2008), pages 1423-1424, Atlanta, USA, July 12-16, 2008. Bergamini, C. M., Oliveira, L. S., Koerich, A. L., Sabourin, R., Fusion of Biometric Systems using One-Class Classification, International Joint Conference on Neural Networks (IJCNN 2008), pages 1308-1313, Hong Kong, IEEE Press, June 1-6, 2008. Abu Hana, R., Freitas, C., Oliveira, L. S., Bortolozzi, F., Crime Scene Classification, 23th Annual ACM Symposium in Applied Computing (SAC2008), pages 419-423, Fortaleza, Brazil, ACM Press, March 16-20, 2008. Hochuli, A., Oliveira, L. S., Britto Jr, A. S., Koerich, A., Detection and Classification of Human Movements in Video Scenes, 2007 Pacific-Rim Symposium on Image and Video Technology (PSIVT 2007), pages 678-691, Santiago, Chile, LNCS 4872 December 17-19, 2007. Dalla Valle Jr, J., Koerich, A., Oliveira, L. S., Britto Jr, A. S., People Counting in Video Scenes, 2007 Pacific-Rim Symposium on Image and Video Technology (PSIVT 2007), pages 737-748, Santiago, Chile, LNCS 4872, December 17-19, 2007. Baranoski, F., Oliveira, L. S., Justino, E., Writer Identification based on Forensic Science Approach, XXXIII Latin American Conference on Informatics, pages 25-32, San Jose, Costa Rica, October 9-12, 2007. Oliveira, L. S., Justino, E., Sabourin, R., Off-line Signature Verification Using Writer-Independent Approach, International Joint Conference on Neural Networks (IJCNN 2007), pages 2539-2544, Orlando, USA, IEEE Press, August 12-17, 2007. Santos C., Bortolozzi, F., Oliveira, L. S., Justino, E., Off-line Signature Verification Based on Forensic Questioned Document Examination Approach, 22th Annual ACM Symposium in Applied Computing (SAC2007), pages 637-638, Seoul, Korea, ACM Press, March 11-15, 2007. Freitas, C., Oliveira, L. S., Aires, S, Bortolozzi, F., Zoning and Metaclasses for Character Recognition, 22th Annual ACM Symposium in Applied Computing (SAC2007), pages 632-636. Seoul, Korea, ACM Press, March 11-15, 2007. Henniges, P., Granger, E., Sabourin, R., Oliveira, L. S., Impact of Fuzzy ARTMAP Match Tracking Strategies on the Recognition of Handwritten Digits, 2006 Artificial Neural Networks in Engineering (ANNIE 2006), St-Louis, USA, November 3-5, 2006. Cavalin, P., Oliveira, L. S., Koerich A. L., Britto Jr., A. S., Wood Defect Detection using Grayscale Images and an Optimized Feature Set. 32nd Annual Conf. of the IEEE Industrial Electronics Society (IECON 2006) , pages 3408-3412, Paris, France, IEEE Press, November 7-10, 2006. Vellasques, E., Oliveira, L. S., Britto Jr., A. S., Koerich, A. L., Sabouri, R. Modeling Segmentation Cuts Using Support Vector Machines. 10th International Workshop on Frontiers in Handwriting Recognition (IWFHR 2006), pages 41-46, La Baule, France, October 23-26, 2006. Koerich, A. L., Britto Jr. A. S., Oliveira, L. S., Sabourin, R., Fusing High- and Low-Level Features for Handwritten Word Recognition, 10th International Workshop on Frontiers in Handwriting Recognition (IWFHR 2006), pages 151-156, La Baule, France, October 23-26, 2006. Freitas, C., Oliveira, L. S., Justino E., Aires, S., Zoning and Metaclasses Improving the Character Recognition, 10th International Workshop on Frontiers in Handwriting Recognition (IWFHR 2006), pages 67-72, La Baule, France, October 23-26, 2006. Granger, E., Henniges, P., Oliveira, L. S., Sabourin, R. Particle Swarm Optimization of Fuzzy ARTMAP Parameters, International Joint Conference on Neural Networks (IJCNN 2006), pages 2060-2067 Wancouver, Canada, IEEE Press, July 16-21, 2006. Cavalin, P., Britto Jr., A., Oliveira, L. S.,An Implicit Segmentation based Method for Recognition of Handwritten String of Characters, 21th Annual ACM Symposium in Applied Computing (SAC2006), pages 836-840, Dijon, France, ACM Press, April 23-27, 2006. Solana, C., Justino, E., Oliveira, L. S., Bortolozzi, F., Document Reconstruction based on Feature Matching, 18th Brazilian Symposium on Computer Graphics and Image Processing (SIBGRAPI 2005), pages 163-170, Natal, Brazil, IEEE CS Press, October 9-12, 2005. Oliveira, L. S., Britto Jr., A., Sabourin, R. A Synthetic Database to Assess Segmentation Algorithms, 8th International Conference on Document Analysis and Recognition (ICDAR 2005), pages 207-211, Seoul, South Korea, IEEE CS Press, August 29-September 1st, 2005. Oliveira, L. S., Britto Jr., A., Sabourin, R. Improving Cascading Classifiers with Particle Swarm Optimization, 8th International Conference on Document Analysis and Recognition (ICDAR 2005), pages 570-574, Seoul, South Korea, IEEE CS Press, August 29-September 1st, 2005. Oliveira, L S., Britto Jr. A., Sabourin, R. Optimizing Class-Related Thresholds with Particle Swarm Optimization, International Joint Conference on Neural Networks (IJCNN 2005), pages 1511-1516, Montreal, Canada, IEEE Press, July 31-August 4, 2005. Oliveira, L S., Morita, M, Sabourin, R, Multi-Objective Genetic Algorithms to Create Ensemble of Classifiers, 3th International Conference on Evolutionary Multi-Criterion Optimization (EMO 2005), pages 592-606, Guanajuato, Mexico, LNCS 3410, March 9-11, 2005. Oliveira L. S. and Sabourin R., Support Vector Machine for Handwritten Numerical String Recognition. 9th International Workshop on Frontiers in Handwriting Recognition (IWFHR-9), pages 39-44, Tokyo, Japan, IEEE CS Press, October 26-29, 2004. Morita M., Oliveira L. S., and Sabourin R., Unsupervised Feature Selection for Ensemble of Classifiers. 9th International Workshop on Frontiers in Handwriting Recognition (IWFHR-9), pages 81-86, Tokyo, Japan, IEEE CS Press, October 26-29, 2004. Oliveira, L.S., Sabourin, R., Bortolozzi, F. and Suen, C.Y., Feature Selection for Ensembles: A Hierarchical Multi-Objective Genetic Algorithm Approach, 7th International Conference on Document Analysis and Recognition (ICDAR2003), pages 676-680, Vol 2, Edinburgh, Scotland, IEEE CS Press, August 3-6, 2003. Oliveira L.S., Sabourin R., Bortolozzi F., and Suen C.Y. Feature Selection Using Multi-Objective Genetic Algorithms for Handwritten Digit Recognition. 16th International Conference on Pattern Recognition (ICPR 2002), pages 568-571, Vol. 1, Quebec City, Canada, IEEE CS Press, August 11-15, 2002. Morita M., Oliveira L.S., Sabourin R., Bortolozzi F., and Suen C.Y. An HMM-MLP Hybrid System to Recognize Handwritten Dates. International Joint Conference on Neural Networks (IJCNN 2002), pages 867-872, Honolulu, USA, IEEE Press, May 12-17, 2002. Oliveira L.S., Sabourin R., Bortolozzi F. and Suen C.Y. High-level Verification of Handwritten Numeral Strings. 14th Brazilian Symposium on Computer Graphics and Image Processing (SIBGRAPI 2001), pages 36-43, Florianópolis, Brazil, IEEE CS Press, October 15-18, 2001. Oliveira L.S., Benahmed N., Sabourin R., Bortolozzi F. and Suen C.Y. Feature Subset Selection Using Genetic Algorithms for Handwritten Digit Recognition, 14th Brazilian Symposium on Computer Graphics and Image Processing (SIBGRAPI 2001), pages 362-369, Florianópolis, Brazil, IEEE CS Press, October 15-18, 2001. Oliveira L.S., Sabourin R., Bortolozzi F. and Suen C.Y. A Modular System to Recognize Numerical Amounts on Brazilian Bank Cheques. 6th International Conference on Document Analysis and Recognition (ICDAR 2001) , pages 389-394, Seattle, USA, IEEE CS Press, September 10-13, 2001. Oliveira L.S., Lethelier E., Bortolozzi F. and Sabourin R. Handwritten Digits Segmentation based on Structural Approach. 13th Brazilian Symposium on Computer Graphics and Imaging Processing (SIBGRAPI 2000), pages 67-73, Gramado, Brazil, IEEE CS Press, October 17-20, 2000. Oliveira L.S., Lethelier E., Bortolozzi F. and Sabourin R. A New Approach to Segment Handwritten Digits. 7th International Workshop on Frontiers in Handwriting Recognition (IWFHR-7), Amsterdam, The Netherlands, pages 577-582, International Unipen Foundation, September 11-13, 2000. Oliveira L.S., Lethelier E., Bortolozzi F. and Sabourin R. A New Segmentation Approach for Handwritten Digits. 15th International Conference on Pattern Recognition (ICPR 2000), Vol. 2, pages 323-326, Barcelona, Spain, IEEE CS Press, September 3-7, 2000. Oliveira L.S. and Bortolozzi F. Morphological Approach for the Pre-Printed Information Extraction of Brazilian Bank Checks. International Conference on Imaging Science, Systems, and Technology (CISST 2000), Vol. 1, pages 277-282, Las Vegas, USA, CSREA Press, June 26-29, 2000.